Since Giles Deleuze took advantage of gravity to smash himself to a pulp on a Parisian pavement a few years ago, the mantle of esoteric/cultic French philosophe du moment has transferred to Alain Badiou. This wiki entry gives a fair indication of the complexity of his thought, combining as it does set-theory as ontology, as well as an utter rejection of any representational theory of aesthetics. 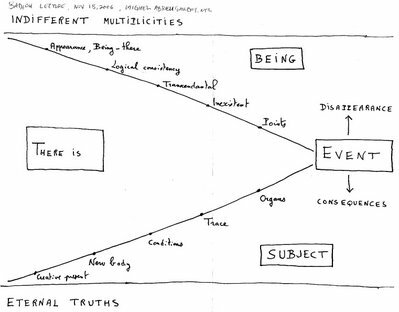 Best of all is the fact that a student has posted a diagram from Badiou's hand from a lecture only yesterday onto the site (see left). Wikipedia always amazes, if you let it. 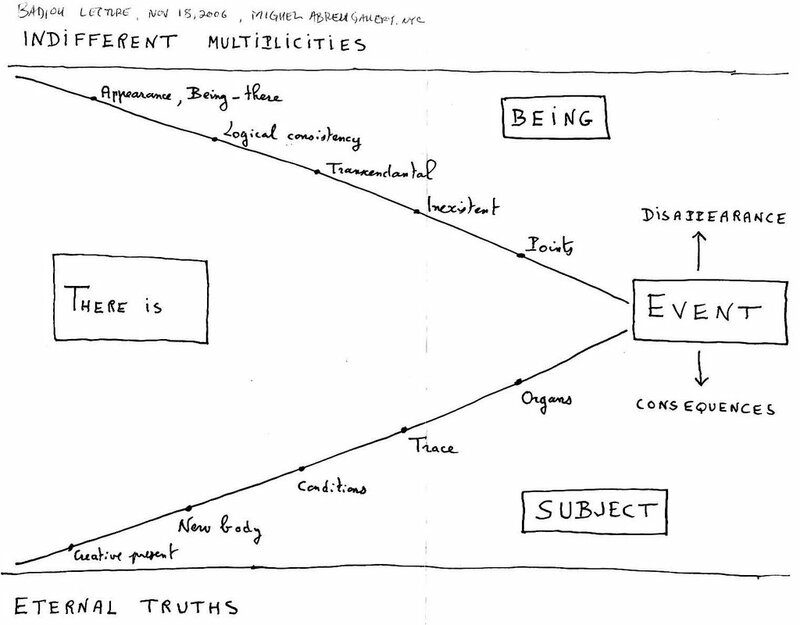 I love it when pseudo- (or soft-) scientists attempt to "empiricalize" their "disciplines" with graphs and charts. It's like watching a cripple try to walk. It's worse than that. It's like watching a full-bodied man pretend to be a cripple. I love philosophy, Jeremy, and abstruse French thinkers don't frighten me, but this is tosh.